The message touched my heart... Something was called forth from my childhood, an inner tug I could not resist. John married Ruth Huey in 1971. Their son, John II, was born in 1974. Their daughter, Rebekah, was born in 1976. John II and Rebekah have given John and Ruth seven wonderful grandchildren. Born in 1951, in Sikeston, Missouri, Pastor is a sixth generation preacher who was called to the ministry at age 15. Over the next eight years, John committed himself to his education in preparing to do the Lord’s work. He received a diploma from Central High School in Cape Girardeau, Missouri, in 1970. At graduation, he had already completed 34 college hours. He earned a degree in Mathematics from Southeast Missouri State University in 1972. In college, John held two rural Missouri pastorates. In 1975, he graduated from New Orleans Baptist Seminary as the youngest man ever to earn a Doctor of Ministry degree from a Southern Baptist seminary (age 23). While in seminary, John and Ruth served Airport Baptist Church in Grenada, Mississippi. From there, they went to Gosnell Baptist Church near Blytheville, Arkansas, to serve three years. In 1978 they led the church in being Arkansas’ fastest growing church. In 1979 the Marshalls moved to First Baptist of St. John, Missouri. For several years this church was one of the fastest growing churches in St. Louis County. In 1985, the Marshalls began serving at Garden Baptist in Bridgeton, Missouri. The Marshalls went to East Side Baptist in Fort Smith, Arkansas, in 1991. While they were there, East Side went to two Sunday Schools and two worship services to help accommodate their growth. The Marshalls came to Second Baptist, Springfield, Missouri, in November 1995. The church is annually one of Missouri’s leading churches in baptisms, and has for many years been the state’s largest contributor to the Cooperative Program. Second has three Sunday Schools (average attendance 1400) and three (two English, one Chinese) worship services (average attendance 1700). Second, nationally known as a missions minded church, has given $2.6 million to plant 51 new USA churches in the past seven years. In 2004, Dr. Marshall was awarded the distinguished Alumnus Award for his Alma Mater, New Orleans Baptist Theological Seminary, one of the largest seminaries in the world. That same year he had the privilege to preach the annual sermon for the Missouri Baptist Convention, his state’s largest denomination. In 2009 he was honored to preach the annual sermon at the Southern Baptist Convention, a denomination that has over 45,000 churches, and is the largest non-Catholic denomination in the USA. 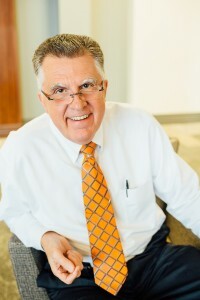 After having served as Second Vice President and First Vice President of the Missouri Baptist Convention, he became President in 2010. A month later, Second honored Ruthie and him on their fifteenth anniversary at the church by giving them a mint condition 1962 robin egg blue Ford Falcon. In 2011 Midwestern Baptist Seminary named him their Honorary Alumnus of the Year. In 2017, he celebrated 50 years in the ministry, and 46 years in marriage. In November 2017, John and Ruth retired, after celebrating their twenty-second anniversary at Second Baptist.